Take a look at any study and you’ll find that cinnamon rolls are one of the top favorite edibles for men. So suffice it to say, I love cinnamon rolls. The complexity of a spice like cinnamon mixed with a sweet sugary glaze. It could be a meal or it could be a simple dessert. Give me that and a cup of coffee and I’m happy. Packaging: The DSRT line starts out with a retro 80’s style black and white pattern with an image of a cinnamon roll in the center (at least that’s what I think it is). The bottom of the bottle lists the nicotine strength and bottle size. 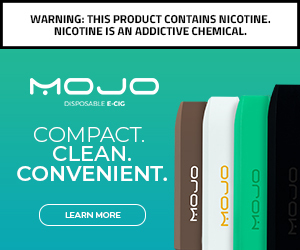 The far left side shows a ton of warnings while the far right side shows ingredients and bottling info with Apollo E-cigs. Flavor: So the key with this is the balance between cinnamon and sugar. Thankfully this comes across as a relatively sweet flavor with just a hint of cinnamon underneath. A perfect blend of sweet and spicy that tends to meld really well together. One of the major reluctant factors for me was the throat hit, given that I received a 6mg instead of a 3. Perhaps this caused the slightly peppery throat hit or perhaps this is part of the flavor (some other flavors in the line had a faint throat hit but not quite this heavy). (This was remedied on a second bottle I purchased. Much smoother taste, but a very slight throat hit that was pretty satisfying). All in all I think aside from that detail, this does an incredible job of blending the two extremes into a wonderful flavor. Cloud Production: This 70/30 blend has some pretty significant cloud production, but not nearly enough to hold form for very long. It’s also important to note that your cotton may last a little longer than expected on this one as well (a huge boon against a lot of other “cinnamon” type flavor profiles. Final Thoughts: The first drip on the hand test I took on this reminded me greatly of a Dum-Dum lollipop, and the sweetness factor seemed to be pretty consistent. This truly is unlike any other cinnamon roll flavors I have tried. Aside from the nicotine flub on what I received, I truly think this would be a pretty incredible choice for an all-day-vape. 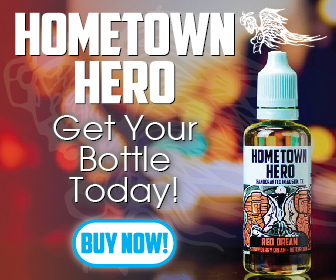 Click the banner below to check out Apollo E-cigs. Use the code “coffeefuel15” to save 15% off your order and support this website! Next Next post: Apollo E-cigs Massive Overstock Sale!